Part one of two posts. Maybe you won’t identify with this story. Maybe by the grace of God you escaped the curse of cultural or racial prejudice that affects both a person of privilege and a victim of racism. Maybe you were raised in an egalitarian environment and are truly free from such burdens. If so, you are among the lucky ones. I could try telling stories here about some of my sisters of color, but I don’t really know their stories well enough. Besides, they can do that for themselves. We would do well to seek out our sisters and listen carefully to their words. My job is to tell my own story with as much accuracy and integrity as possible. So, I’ll start there, hoping it will lead to an increased awareness of how some of us can reach toward greater inclusion of all our culturally diverse sisters in conversations and as friends in our day-to-day lives. I feel moved to invite white sisters to actively acknowledge and champion the concerns and causes of Mormons of color as our own (feminist or not) or, I fear, we will ultimately fail in our mission as Mormon feminists. By approaching this subject I risk exposing my weakness and immaturity in the realm of intersectionality within Mormon feminism. But I feel strongly about it. That’s why I’m writing. Like you, I care about all sisters and about each woman’s pain, her worldview, her life experience – especially as it differs from mine. I care most of all about the space we share as Disciples of Christ, where we are one. 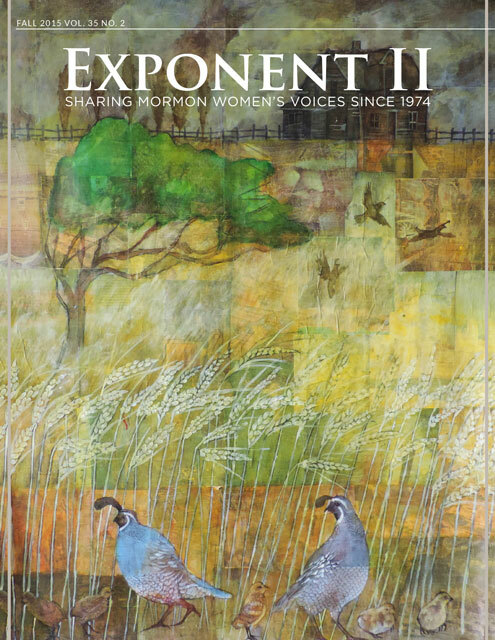 The-Exponent has recently brought diverse voices from our international community of readers. These voices have helped to broaden our understanding and enrich our lives as Mormon women. Exponent has always been a place of inclusion and empathy for our sisters. We stretch to understand each other’s stories. We are rightfully proud of our 40 year Exponent II history. 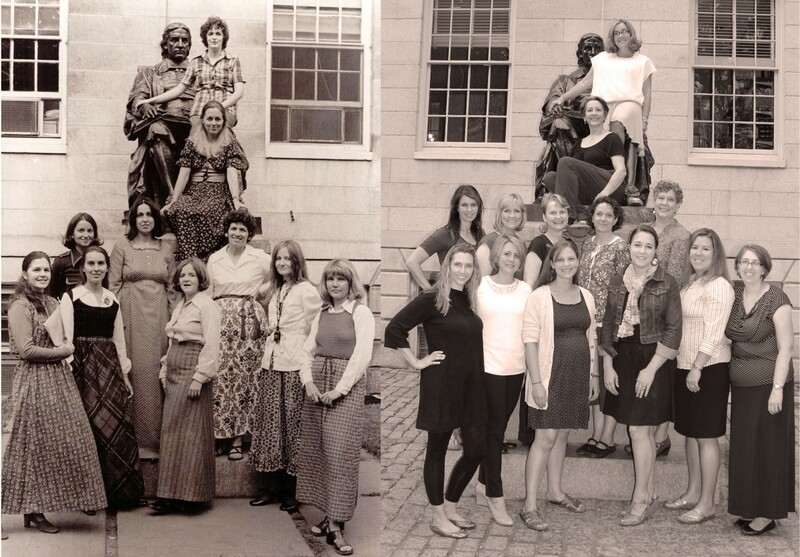 I love this side-by-side photo of the founding Exponent II mothers and our current board. We are a robust community of women and have been for a long time. In the context of this post, however, do you see a problem with this picture? Who are we as feminists, and whom do we represent? Can we represent all women in the church when we don’t fully include all women in our circles of influence? We are doing great things, but we can do better. I can do better. That’s why I’m here. I was born on the east coast but spent most of my childhood and adolescence in an upper-middle-class LDS neighborhood in Utah. Local business owners, politicians, doctors, and university professors headed the families who lived on our street. Most of the moms in our neighborhood where full-time stay-at-home parents. Looking back now, I feel I can safely say that ours was also a racist neighborhood. From my perspective, the feeling bordered at times on something close to white supremacy. Not that we were haters or cross-burners-on-lawns of our dark-skinned neighbors. In fact, we had no such neighbors. But, we felt comfortably superior. At least that’s how I experienced things. My own father had been raised in Ogden, Utah, and he occasionally made derogatory comments about it being a railroad town, and how this brought blacks from around the country either as employees of the railroad or as drifters who used the rails for transport from state to state. The underlying message was that African Americans were an “undesirable element” in Ogden. He made vaguely derogatory comments about Native Americans too. My father and other adults of his generation were seen as good, upstanding, worthy Latter-day Saints. The majority of our neighbors were genuinely good people. But when the older men spoke of their missions to South America, the Pacific Islands, or to Native American communities, they often referred to “those people” with a sort of polite condescension. They were the “other” whom missionaries learned to love and to serve. Again, I am recounting a general feeling, not an all-inclusive pattern. A few among this group seemed to have been truly altered by their mission experience; men who viewed their brothers and sisters as equals regardless of culture, skin pigment, or socioeconomic status. But those people were exceptional in my experience. I recall hearing racial slurs at church from time to time from certain individuals in the ward. I do not recall ever hearing conversations about inclusion or diversity. There simply wasn’t a need. We were all white. Renowned LDS scholars and Church leaders of the day publicly espoused the idea that fair-skinned people were superior. The message was clear: God had cursed people of color, particularly African Americans and Native Americans. They were inherently, inexorably, and divinely relegated to an inferior spiritual and social status as a result of some unknown folly in pre-earth life or because they descended from Cane or Laman and Lemuel. There was nothing cruel or abusive about this message in the eyes of most church members. We weren’t expected to shun such individuals or treat them unkindly. We simply understood they were inferior. Because adults around me taught and seemed to accept these explanations I had no reason as a young child to question them. I overheard conversations between adults, listened to primary lessons and sacrament meeting talks, looked at photographs of prophets and images of ancient biblical personalities – who were all white – and never considered ulterior motives or possible prejudices of my teachers. As children do, I learned by observing. Only a handful of Native Americans, Latinos, Asians, and Pacific Islanders attended my elementary, junior high, and high schools. The rest of us were North American white kids. Around the age of ten I became acutely aware of subtle and outright cruelty directed toward non-white children and anyone else who seemed “different.” I can’t say that I recognized this as prejudicial behavior; I just knew it was mean, so I distanced myself from the worst offenders and became friends with those on the margins of that childhood culture. This wasn’t a conscious choice, but rather an intuitive response to violence. I knew which side I wanted to be on, and it wasn’t the bully’s side. During my four years of high school in the late 70’s only two African American students appeared – and only for a year – two young men, siblings, a year apart in age. (Our high school population was around 1000 students at the time.) I liked these young men. They were tall and slim, like me, and really good-looking – which was important to a sixteen-year-old, tallest-girl-in-the-class. They were welcomed by most of the students. But they didn’t stay long. I don’t recall why they moved away, but I wonder if their parents recognized the challenge these boys would face if they remained in our community. Years later my own children attended elementary and secondary schools in the same town. Thankfully, their experience was different than mine. Their friends came from diverse cultural backgrounds and none of my children inherited the “false traditions their fathers.” My son’s best friend for several years in elementary school was Ahmed, an African American Muslim. This may not seem unusual in many readers’ experience, but even with growing diversity, this was Utah County in the 90s and it was unusual for us. When Ahmed’s family moved further south in the county, his mom and I spent a good deal of time transporting our sons back and forth to maintain their friendship. Around this same time I returned to school to obtain a nursing degree. During those years in college as a grown woman, on my own, with three young children, I had several experiences that moved me further away from the distorted views of humanity with which I had been raised. How do you feel about intersectionality in Mormon feminism? Have you seen racism within the Church in your community? I also grew up in a predominantly White, Mormon community. I identify with much of this. Thanks for these observations. Hope it’s okay if I make a comment. White male, raised as a Davis County (north of Salt Lake County), graduated *from* high school there — Do we really want graduated high schools? — in 1966, left for a German mission, temple married, and active — although often I perceive others wishing I’d not be — throughout my life. Similar experiences to yours growing up in Utah, so I enjoyed your articulations and look forward to more. I’d add one other observation, if I may. My siblings and I were raised by a non-member father and an always-inactive mother. The language for them inside the church was Gentile and Jack Mormon and they were also almost always in active-member parlance, lesser-thans. I must admit, however, that my parents also at times had their own derogatory nomenclature for active members. Furthermore, my parents were also subject to the better-than syndrome relative to the minorities that you mentioned. Good point, WReddyornot. Thank you for commenting and offering your perspective. Superiority takes many forms and we can do better accepting and respecting each other all the way around. For many people racism is the big beast, the elephant in the room (the world). And it’s been a problem for centuries. Thank you for being willing to speak truth, about some elements of the past and present even when it isn’t pretty. I appreciated this. I remember being exposed to some of what you describe. Good post Melody. I am glad this conversation is happening. I am starting to recognize in myself and my upbringing the thing you mention here. It’s not blatant racism, but more of an unconscious priviledge. I thought I was all about equality until I began to wake up and understand better the experience of minorities and people of color. I’m sure I still have more waking up to do. I think you nailed it with your comments on the two pictures of white feminists. Waking up means noticing when people of color are missing. I have learned from feminism how important symbolism is to our subconscious minds. Young girls who see women in leadership positions will understand that that is part of their potential. That’s why we need people of color among us and we need to become more aware of areas where they are missing. I think the symbolism of us working equally together will help the next generation grow up with race consciousness, not unconscious racism. Looking forward to part 2. Thanks Jenny. I will never forget the first time I thought about how it must be for a person of color to sit and watch a temple film. It’s shocking and sad. But, yes, there is a lot of hope for the future. Change takes time. It sound like you’re in a good place. Your children are fortunate to have you for their mom. Melody, I respect and admire the way you are deeply interrogating your upbringing and seeing the privilege and superiority which was part of the culture in which you grew up. I grew up in a So Cal majority Asian and white community, with few Latinos and blacks. I’m sure I must have soaked up some superiority ideas, but I do remember things that really brought to light my own privilege and the injustice in our society regarding race. One was reading Mildred Taylor’s Let the Circle Be Unbroken book in 4th or 5th grade. How I sobbed when I read about the racism and poverty that family endured. I also as a young teen saw multiple times the movie Guess Who’s Coming to Dinner, and was extremely moved by the depiction of the interracial couple in the 60s trying to win their parents’ support for their marriage. I’m grateful that books and movies like this helped to shake me out of my complacency. Caroline, I hadn’t thought about how art and literature are full of lessons for us about privilege. Thanks for those excellent examples. And thanks for your enlightened leadership within the Exponent world. As a 64 year old white woman, I know that my instinctive responses are often based on the race and class concepts I learned from my nice but (and they of course would deny it) racist parents. My mother was more tolerant than my dad, but she was very concerned that I have “nice” friends who would enhance my social standing. They were both vehemently opposed to the fair housing laws of the 60’s.